What journalism can learn from games aimed for positive social impact. Today was the first day of the 10th Games for Change Festival, a conference in New York organized by Games for Change, an organization that seeks to create games with a positive social impact. If you think about it, positive social impact is a goal that’s similar to ours as journalists. Naturally, as I listened to the diversity of presentations today dedicated to social reach, education, impact and even fighting censorship, I found many lessons that apply to what we’re doing in newsrooms. Michael T. Jones, chief technology advocate at Google, spoke about an augmented reality game they’ve developed called Ingress. Watch the trailer below. The basic concept is simple. Users are agents, working for one of two opposing sides. The rules require agents to physically travel around the real, nondigital world with their “scanners” (smartphones) to hack the various “portals” (public art pieces) around them, thereby collecting “mind units” (points). The side with more mind units wins. You can play by yourself, or you can team up, and according to Google, Ingress players have coordinated massive international missions. Similar to geocaching, Ingress is a game that is played hidden in plain sight, in which players must be in on the secret to play the game, which adds to the fun. You can play it with friends or family, and you can play it in your neighborhood or when you’re out on a business trip. In journalism, we’ve heard over and over again that mobile is the future. So what kind of storytelling can we do to take advantage of the fact that if they’re on their smartphone we know our readers’ physical location, and that with the right inspiration, they are willing to move great distances? What if on election day, we could help voters find their most convenient polling locations? Or if that location is busy on arrival, we could re-route them to another location nearby, and if many users are re-routing, we could use that data to understand which polling locations were busier than the rest? This morning I made my first Tiny Game. Tiny Games are games that can live in your head. They have simple rules and require only your imagination and the objects that surround you. Created by the design studio Hide&Seek, 99 Tiny Games were placed all over London in the spirit of the 2012 Olympics, turning everything in the city into a game. You’re at a large plaza that attracts a fair number of people daily. This is a racing game for two or more players, and your goal is to race from one end of the plaza to the other. However, you’re only allowed to move while making slight contact with a complete stranger. This idea of using real objects already close at hand to create a game really fascinated me, and reminded me of the Washington Post’s popular interactive graphic, Workout At Work, which includes using office chairs and desks as workout aides. What else can readers do from the office, or at home, that could help them understand a story? What if, when applicable, our interactive or print graphics also included mini science experiments readers could perform just with the items in their kitchen, to help them understand the science better? 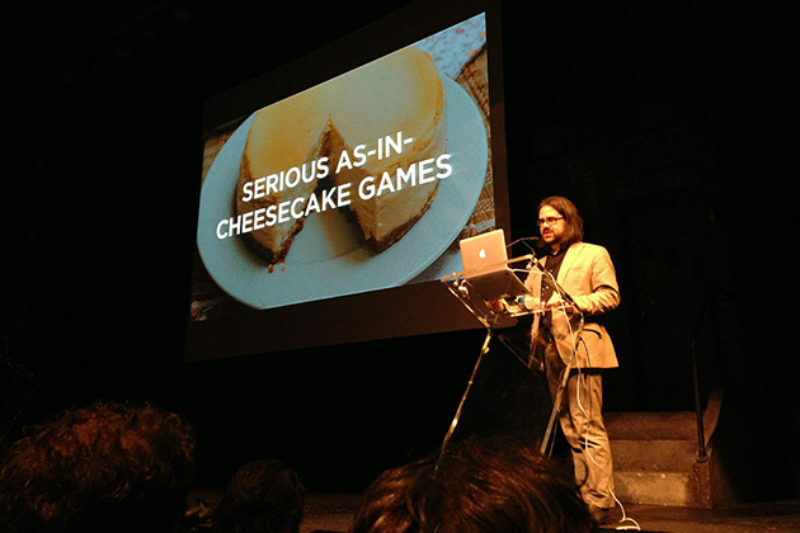 Ian Bogost, co-founder of his own game studio, has written extensively on the topic of games (even one book on newsgames). He gave one of the closing keynotes of the day and talked about a game called Oiligarchy. While he liked the game, it raised an important question. Bogost pointed out that the creator of Oiligarchy, Molleindustria, wrote up a “postmortem” explaining the game in great detail, including how it was loosely based on something called the Hubbert peak theory. The postmortem, which featured an explanation of the theory in text and a chart, as well as minute details about other parts the game, raised a question for Bogost: If a piece of text can explain something better than a game, why make the game in the first place? Bogost didn’t really mean to single out Oiligarchy, but the point is a good one. As journalists, the way we explain a tough concept to readers should be as complex as it has to be — but no more so. That’s true for text, interactive graphics, news applications and even newsgames. If a simple chart or written paragraph explains a concept faster and better than a more complicated, albeit eye-pleasing graphic, then we should think twice about running the graphic. She talked about her theory of “Triple E” in game design: Games that are elegant, emotional and expressive. In the end, she said, “the key isn’t money or slick graphics. It’s curiosity.” Hunicke would know. Before starting her own game design studio, she worked for Electronic Arts on popular titles like The Sims 2. She was also executive producer of Journey, an artistic, non-violent video game that swept gaming industry awards in 2012, and cost far less to produce than the major titles made by her competitors. The New York Times’s Snow Fall project was elegant, emotional and expressive, and the world took notice. It was the right format for the right story, and months of painstaking work resulted in a project that communicated emotion not only in its words but in its design and in each of its individual elements. Couldn’t more of our long form stories, in which we’ve often dedicated months of hard work, be presented online in a way that maximizes it's individual elegance, emotion and expression? The conference runs through Wednesday. Tomorrow’s sessions promise more lessons from the gaming industry about design, education and impact.